There was just one finger left and I was extremely excited to have been the one to get it. 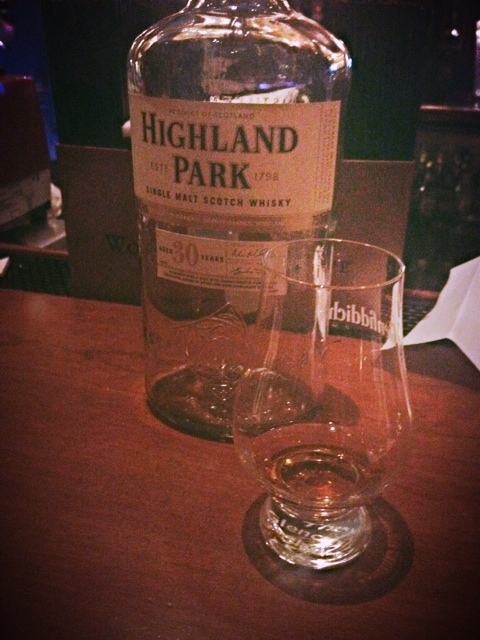 I was taught to share as a kid, but with just one finger left I was not sharing this Highland Park 30 with anyone. I got this last finger courtesy of Frank at The Last Hurrah. It’s the place I go to whenever I crave whisky knowledge and whisky off course. The Highland Park distillery has been established since 1798 and located in the Orkney Islands in Scotland. They like very few other distilleries still use the traditional malting floor method. Basic floor malting explanation: First thing, before barley can be placed on the floor it is soaked in water. This actually makes the barley grow in bulk. It is then placed on the floor to dry and prevent it from growing any further. Once on the floor, it is turned (raked) often enough to ensure that its growth is even. It’s a method that is expensive and takes time, but well worth it when you taste the final product for both these whiskies. Amazing was the first word I said after tasting this 30 year-old. I just sat back on my chair and enjoy, without sharing. It was absolutely satisfying. Hands down, one of the better whiskies I have ever tasted. I loved it! Although a fantastic whisky, the downside, a bottle based on my search, would cost around $300-$500 (and you wondered why I wouldn’t share the finger I got. I am sure you might have done the same). Even though I love this whisky, I definitely can’t afford to keep drinking it or even buy one bottle. I did find that Highland Park does sell miniature bottles of the 30 year-old and those were around $20-$25 or so. That is certainly more like a price I can deal with. If you ever find yourself near a mini bottle, this whisky is a must try! This 30 year-old is spicy, sweet and smooth. It is beautifully made and certainly worth trying, even if it’s in a tiny bottle. You will not be disappointed. So far my favorite of the Highland park core range. Cheers!